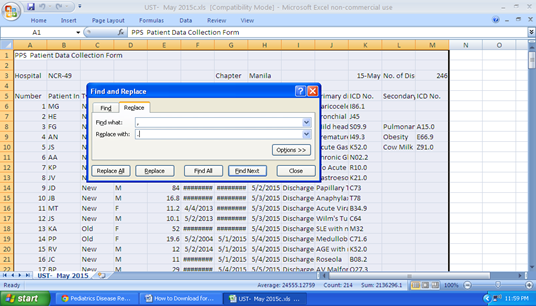 How and What to encode in the Data Collection Form, and how to save file in .csv format and attached the file with same file name | Philippine Pediatric Society, Inc.
DO NOT CHANGE the format of the data collection form. 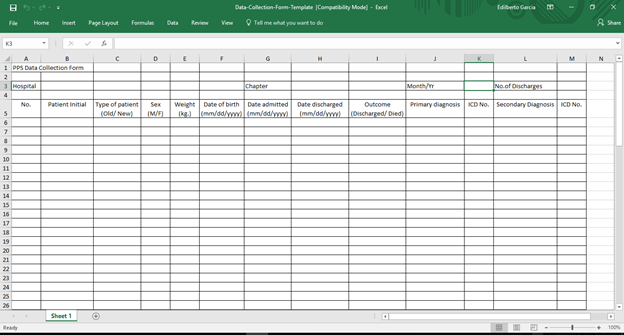 All data should only be in one sheet (sheet 1). DO NOT FILL UP other sheets. on the left button of your mouse, drag the line downwards. 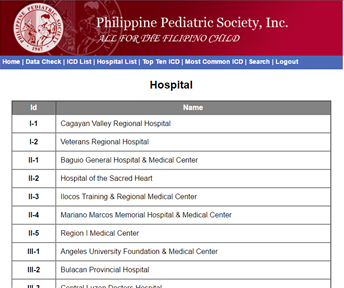 code by clicking on the link Hospital list in the ICD-10 Registry page. Chapter: Type chapter you belong to on column H.
Month/Yr: Type month/year (e.g. January 2017) on column K.
Please make sure the format is mmm-yy (e.g. Jan-17). and the row number in the grid. 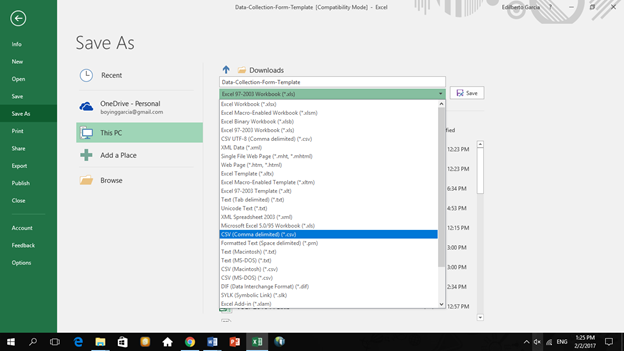 one row per data entry. You may use abbreviation for your diagnosis. (B) Patient Initials: Enter initials of the patient. (C)Type of Patient: Enter only either Old or New. This is important for those diseases that may are may be chronic (Congenital, or acquired eg. CHD, Lupus, GN, etc), this should be in reference to the secondary diagnosis. For dates (e.g., June 15, 2015) it should be in mm/dd/yyyy format (06/15/2015). Please take note of the date separator “/”. (I) Outcome: Enter only either Discharged or Died. No other entries should be made in this column. If patient was HAMA, TPR, THOC, please enter Discharged. (J) Primary diagnosis: Why patient was admitted in the hospital. Enter disease name. Only one diagnosis should be entered. (K) ICD no. : Enter the ICD no. for the primary diagnosis. Only one ICD no. should be entered. (L) IF there is a Secondary diagnosis: Fill up the Secondary diagnosis column. Please make sure that the secondary diagnosis does not duplicate the primary diagnosis. If the patient has a chronic disease, you should enter it here. Only one secondary diagnosis should be entered. (M) ICD no. 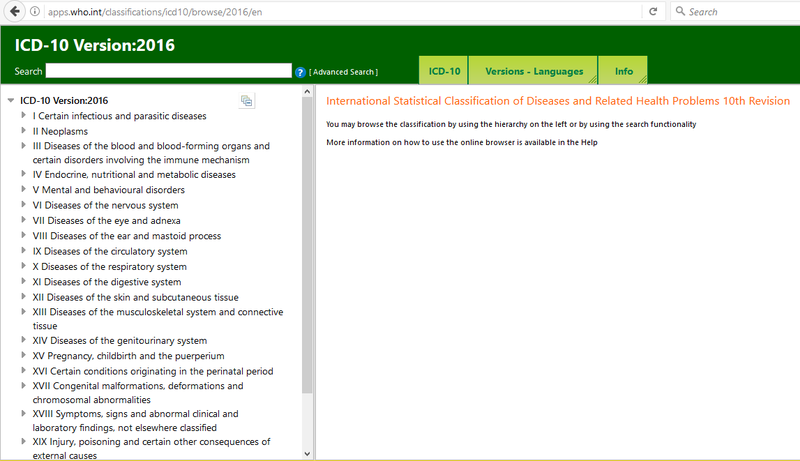 : Enter the ICD no. for the secondary diagnosis. Only one ICD no. should be entered. Indicate in the type of patient if this is a new diagnosis or an old patient (previously known case). 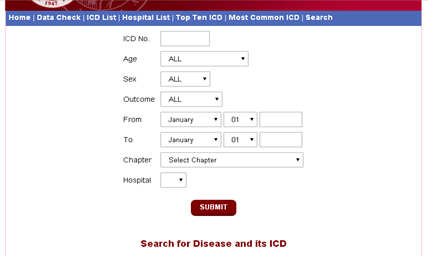 ICD-10 Registry page and click on the link ICD Search. Clinical warning signs are: abdominal pain or tenderness, mucosal bleeding, lethargy and /or restlessness, rapid decrease in platelet count, increase in hematocrit. Other signs can include: persistent vomiting, visible fluid accumulation, liver enlargement more than 2 cm. check your files for errors.